Woolworths Christmas Pet Food Appeal is back! For almost thirty-years generous Woolworths shoppers have kindly included feeding our shelter dogs and cats on their Christmas shopping list, and by doing so helped fill the bowls of tens of thousands of deserving animals each year. Entering its twenty-eighth year, the Woolworths Christmas Pet Food Appeal is our biggest annual food drive and we are very proud and delighted to say that it is back. 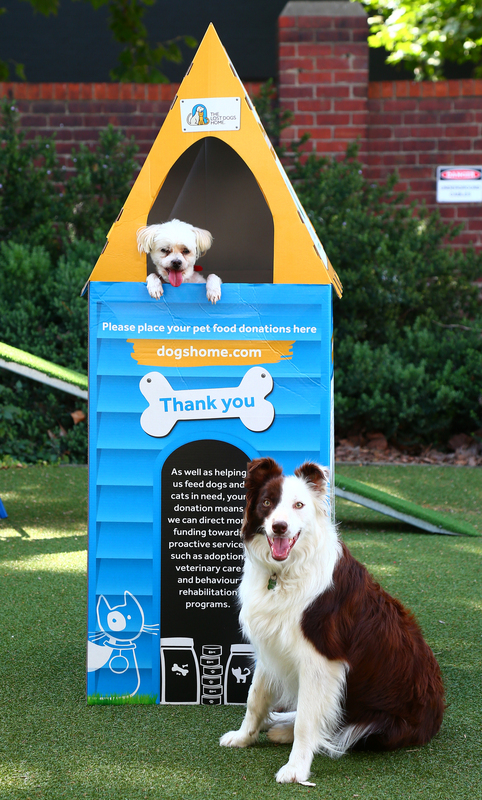 From Ashwood to Melton, our kennel shaped appeal bins are making a return to 61 participating Woolies stores across Victoria (click for list). In previous years, shoppers have dug deep to raise $100,000 worth of cat and dog food, representing over 80 per cent of the total amount of food the Home needs to feed our shelter animals over the course of a year. Food donations also help us direct more vital resources to the running of important services including our behaviour rehabilitation and adoption programs and 24-hour Animal Ambulance Service. Cats and dogs of all breeds, sizes and ages enter our shelters on a daily basis. As a result, a variety of wet and dry food and treats are welcome! We are in special need of specialised food for puppies, kittens and seniors. We also tend to run low on cat food the quickest – so please don’t forget our whiskered friends! On behalf of our shelter animals, we’d like to thank Woolworths and all Woolies shoppers who show their overwhelming support each and every year!